March is the start of spring in London so you should enjoy mild days with some blue skies—perfect weather for being outdoors, especially as the flowers begin to bloom. Take the chance to go on a guided walking tour or visit Kew Gardens to see the changing floral landscape. A visit to Hampton Court Palace and gardens or a cruise on the River Thames are also ideal activities at this time of year. Early springtime is shoulder season in London, meaning there are fewer crowds and more affordable hotel rates. 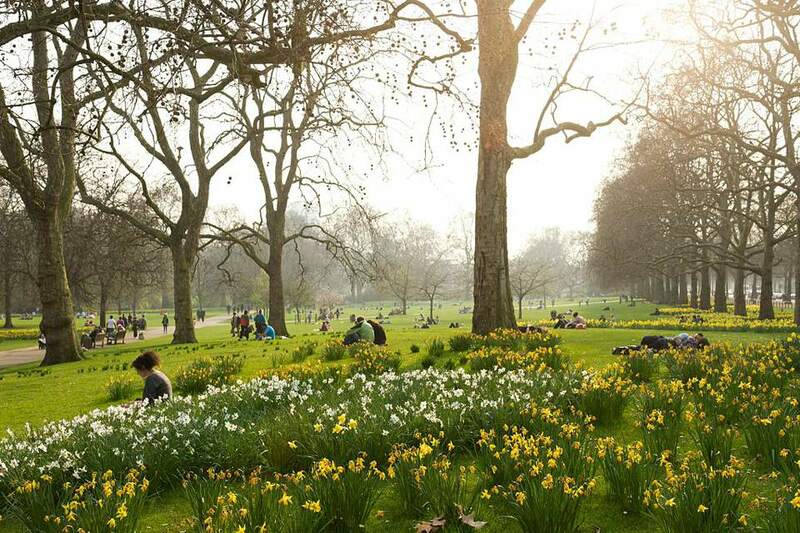 Springtime in London brings mild weather, with temperatures staying between 50 and 60 degrees Fahrenheit. There's less of the winter rain, and no summer mugginess to be found, so it's much more comfortable to walk around and see all the sights. There are about 10 days of precipitation in March, but the rain in London tends to be a light drizzle instead of heavy rain. There are, however, only about four hours of sunlight in the afternoon on average, so expect some overcast skies. Because part of the month of March is rainy in London, pack plenty of layers and a waterproof jacket, as well as an umbrella (which, really, you should always bring when exploring London!). It won't necessarily be warm yet, though, so you will still need a coat and possibly gloves and a scarf, too, on some days. Plan ahead to catch some of the many activities and celebrations happening in London during the month of March. Mother's Day: The holiday is celebrated in March in the U.K. vs. May in the U.S. This is a perfect time to book an afternoon tea together as there are always Mother's Day specials offered. Easter: Easter can fall in March or April and brings the first bank holiday of the year. Brits give each other chocolate eggs and put on Easter egg hunts for children with either small chocolate eggs, dyed hard-boiled eggs, or plastic eggs filled with treats. St. Patrick's Day: London celebrates the holiday on March 17 (or on the closest weekend to it) with a fair in Trafalgar Square, a parade through Central London, and plenty of festivities at pubs. Shrove Tuesday/Pancake Day: The Tuesday before Ash Wednesday, known as Shrove Tuesday, is celebrated in either February or March. In the U.K., the tradition is to feast on pancakes before the start of Lent. There's also a longstanding tradition of Pancake Day races throughout the U.K., including in London, where contestants run while flipping pancakes in a pan (quite a sight to see for visitors!). Restaurants often have pancake specials on this day as well. Ideal Home Show: This exhibition, founded in 1908 to show off the latest trends in home decor, occurs over several weeks in March or April. Crafters and cooking enthusiasts won't want to miss this annual event. Head of the River Race: This annual rowing race on the Thames is typically held on the third or fourth Saturday of March. Locals and visitors often line up along the riverbank to watch the spectacle. The Boat Race: The famous Boat Race between Oxford and Cambridge Universities, which occurs after the Head of the River Race in late March or early April, draws crowds of more than 250,000 people each year. British Summer Time (similar to Daylight Savings Time in the U.S.) begins on the last Sunday in March, so be prepared to move the clocks forward one hour at 1 a.m.
Easter Sunday is treated like Christmas Day so shops are generally closed, but museums and attractions typically stay open. If you're planning on celebrating Mother's Day in London, be sure to book your events like special teas or dinners in advance, as reservations are limited and go quickly. Hotel rates might rise when the famous boat races are in town, due to the large numbers of people visiting.